The Liaoning Song and Dance Ensemble was established in 1956, whose predecessor was the Song and Dance Ensemble of the Northeast People's Art Theater which was established in 1951. Since the establishment of the ensemble, more than 30 works and over 20 artists of the ensemble have won both domestic and foreign prizes. 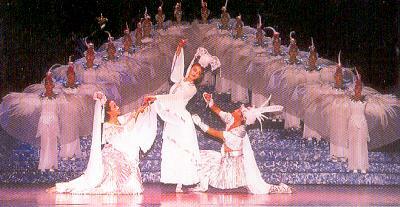 The main programs include: national dance drama "Wang Gui and Li Xiangxiang"; mythological ballet of Man nationality "The Pearl Lake" and "white Deer Mother"; modern dance drama "The Echo of the Polar Region"; national dance drama The Mountain in the East"; songs "Paying a New Year Call", "I Love the Mountains and Rivers of the Homeland, and "The Song of Pendulum; music "Triumph Cheering", "Flipping the Whip and Busy with Carrying Grain", "Reservoir Attracts Golden Phoenix"; dances "Lady with the Single Drum", "The Holiday Night", "Net Weaving Dance, "In the Orchard", "The Death of Lin Daiyu" and "Red Candles, and group dance "Folklore of Northeast China. The Ensemble has visited over a dozen countries and regions such as the former Soviet Union, Germany, France, Yugoslavia, Japan, Pakistan, the DPR Korea and Hong Kong region. The Ensemble has well-known artists including: Wu Shanling, Gao Feng, Wang Zhuo, Yang Zhizhong, Liu Liansheng, Zhao Rongwen, Li Jingbo, Cui Aihua, Chen Ying, Yang Ling, Zhang Shubin, Wei Xianzhong ,Liu zhiguo, Liu Zhigang, Zhao Fulin, Li Miaomiao, Sun zhaohui and Liu Zhong.